You know those people who take at least 1.5 times longer to do something than anyone else? It doesn’t seem to matter what exactly they’re doing; if they’ve undertaken a certain task, you’d better get comfortable and expect them to be running late. It’s probably frustrating to be on the receiving end of that, wondering why exactly your friend is taking 45 minutes to eat dinner or compose an email. I say probably, because I am inevitably the slow person, and that’s something I’ve been working to change in grad school. “Done is better than perfect” seems like more practical life guidance than “take all the time you need to ensure that absolutely everything is just-so because who needs sleep,” and I know that grad school responsibilities are small peas compared to those of Real Adulthood. With that in mind, and because this week is a little nuts, I’m trying an experiment. I’ve given myself 20 minutes to read up on Florida’s recent climate change, um, opinion, which I selected because it’s current and I’m feeling edgy enough to take on a news story that would usually be covered by Justin. Any of the following is not meant to be the final word or even the most accurate summary of the issue. There’s a certain practicality to that, and I’m not just trying to justify being lazy here. There has been a slew of articles recently about the public’s distrust of science, and I’m guessing that if a non-scientist decided to investigate a scientific topic, 20 minutes is a generous estimate of the amount of time they’d devote to that endeavor. What could they learn in that time? I also attempted to mimic the way that a general audience would research a scientific topic: Google it. A state where this happens should definitely not worry about climate change. Image from http://www2.ljworld.com/photos/2005/aug/30/63546/. The upshot of the 12 tabs now open on my browser? Employees of the Florida Department of Environmental Protection (DEP) have recently accused Rick Scott, the state’s Republican governor, of intimidating them into wiping the phrase “climate change” from their lexicon. The unwritten policy has reportedly been in place since the governor took office in 2011. Scott denies the allegations, but has never attempted to disguise his contempt for climate science. He has repeatedly insisted that he is not a scientist (thank goodness), as if such a reminder excuses him from paying attention to the many scientists under the employ of the State of Florida. One of those scientists, Bart Bibler, is currently on leave from his position at the DEP after taking notes on the Keystone XL Pipeline during a meeting in Tallahassee this February. His notes apparently included ample reference to climate change, and when he refused to revise them as suggested, he was reprimanded and asked to receive a medical inspection before returning to work. Bibler has not yet resumed his post, and some sources speculate that he was referred for mental health counseling. Most articles were overwhelmingly sarcastic in their treatment of the issue. When faced with the absurd concept of handling climate change by ignoring it, it’s difficult to react with any semblance of seriousness. 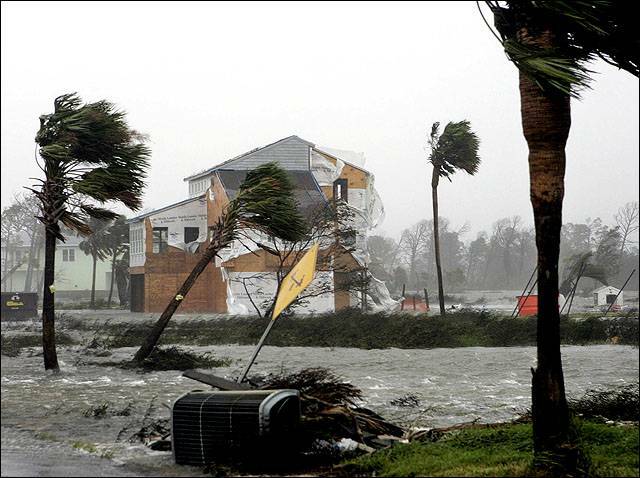 At least three or four articles found an overwhelming parallel to George Orwell’s 1984, suggesting that Florida had become a subtropical Oceania where acknowledging a certain atmospheric phenomenon was tantamount to thoughtcrime. A post in The Atlantic further unpacked Orwell’s philosophy on the power of language by tracing the use of the phrase “climate change” over the more alarming “global warming;” the former was promulgated by consultant Frank Luntz during the Bush administration to downplay the issue. I only read one article suggesting that, although the Florida story might be easily lampooned, treating it like an article in The Onion might minimize its seriousness. That Huff Post Green article reminded readers that Scott’s policy went as far as to impact academic publishing. Earlier this year, a University of Florida PhD student was asked to delete “climate change” from a paper submitted to the Department of Health. The topic of that report? The impact of climate change on ciguatera in Florida. The turquoise areas in this map would be below the high tide line with a 5 ft sea level rise. The map is annotated with the number of homes affected and property value lost in major cities. Sea level rise predictions vary, with 5 ft generally considered probable in 100-300 years. Click on the image to enlarge it. 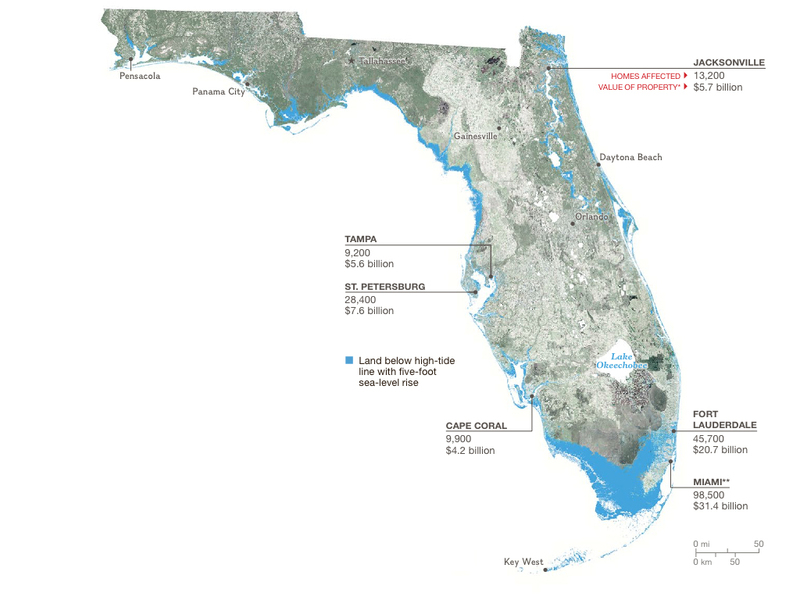 Image from http://ngm.nationalgeographic.com/2015/02/climate-change-economics/florida-coast-map. With its low-lying topography and subtropical climate, Florida was widely acknowledged in my reading as being particularly susceptible to climate change. (Global warming? I now feel as though I’ve been duped by Frank Luntz when I use that phrase.) If I hadn’t gone into this project without an understanding of climate science though, I wouldn’t have developed one from the articles. The potential impacts of sea level rise, stronger hurricanes, and spread of disease were frequently referenced, but none of the articles attempted to provide a scientific primer to underscore the absurdity of Scott’s mandate. I thought this was just fine. These were current events news articles that aimed to explain a particular situation, and there are plenty of resources out there to learn about climate change itself. However, I think the Huff Post article was onto something in critiquing the tone of other articles on this subject. Levity can detract from reality, and the reality is very somber indeed. 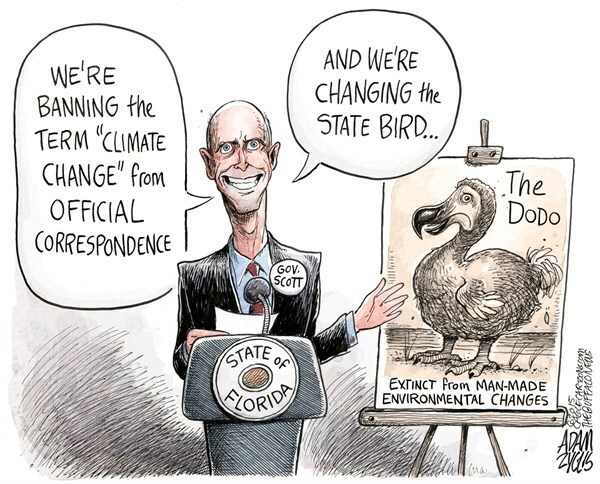 It’s too easy to read most of these articles, have a good chuckle over Rick Scott, and move on to skimming more headlines without reflecting on the implications of Florida’s policy or being spurred to read more about climate change. Language can absolutely impact perception, and if climate experts in Florida can’t even reference climate change, there is little hope of educating the general public or enacting environmental policy change. There you have it- done, not perfect. Hopefully Rick Scott’s environmental policy adopts slightly higher standards though, or the state might be done for. Tags: Climate change, climate science, Current Events, Florida, global warming, Policy, Rick Scott. Bookmark the permalink.